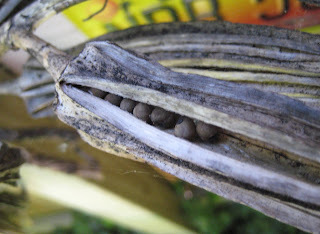 I'm loving watching a bundle of okra pods weather on my patio. They become more sculptural as the browns fade to black and white. The seeds line up efficiently inside the long channels of the pod. It's one of nature's designs for fitting the most seed into the smallest space. Tiny holes are lined up along the edges of the canna leaves. The hole-maker must be nature's own 3-hole punch.